Tom Crum used to have a great saying in his workshops, When a pickpocket meets a saint, he sees only his pockets. What a great reminder that what we see in any situation is greatly influenced by our filters - all of our thoughts, values, heritage, etc. While I was in New York City a few weeks ago, I passed by a quiet oasis beside a church. There were some brightly colored flowers blooming, even though it was mid-November, so they really stood out. I love to the detail in flowers so I snapped a few photos. I saw only the colors and intricacies of the flowers and leaves. This morning I was perusing my many photos as I considered a post for today. 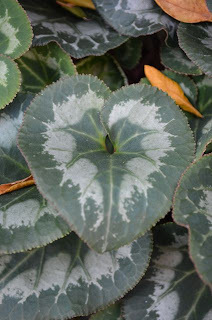 One of those photos jumped out at me - not for its botanical charactistics but because it formed a perfect heart. Have a great day and be aware of those filters! Thanks for the reminder, Judy -- and what a lovely photo! Lovely photo...thanks for the reminder about filters, Judy.